The Earth passes 250 miles below spacewalker Ricky Arnold today while he is attached to the tip of the Canadarm2 robotic arm in the middle of swapping television camera gear. Expedition 55 Flight Engineers Drew Feustel and Ricky Arnold of NASA completed the fifth spacewalk of this year at 2:10 p.m. EDT, lasting 6 hours, 31 minutes. 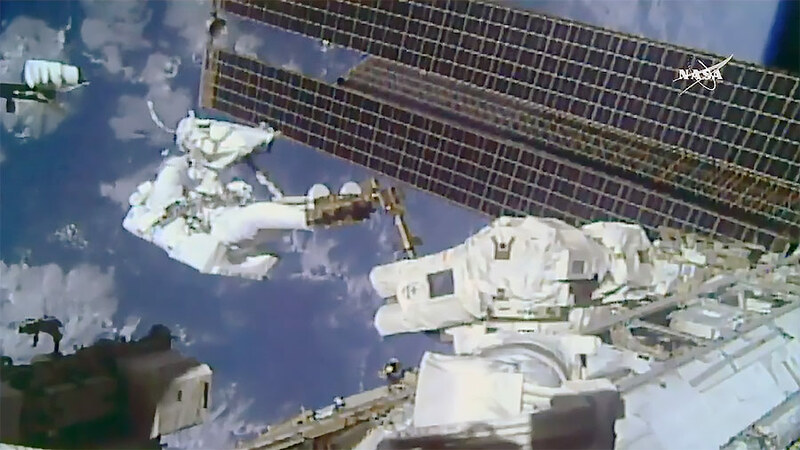 The two astronauts moved the Pump Flow Control Subassembly (PFCS) from a spare parts platform on the station’s truss to the Dextre robotic arm. The PFCS drives and controls the flow of ammonia through the exterior portions of the station’s cooling system. The team then removed and replaced a camera group and a degraded Space to Ground Transmitter Receiver Controller, and was also able to complete several get-ahead tasks. Spacewalkers have now spent a total of 54 days, 16 hours and 40 minutes working outside the station in support of assembly and maintenance of the orbiting laboratory.